You and your friends are cordially invited to Frederico's next Open Studio on Sep. 28 & 29. Authentic Filipino dinner will be served starting at 6 p.m. on Saturday night along with great wine and superb appetizers! Frederico will be presenting over 200 works of art which include original paintings and drawings from 1980-2002. 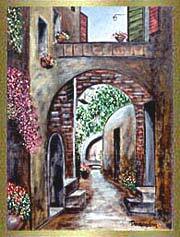 His new masterpiece "Villa in Gubbio" will be on display, as well as his giclees on canvas, prints and gift items. Come and join Frederico on this special weekend filled with fun, food and lots of art! In 1994, at 30 years of age and working as an accountant, Frederico Domondon sold his "Water Lilies" for $250. In 1996, he sold his "Pond in Giverny" for $3,000. 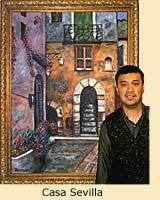 Four years later, "Villa in Alassio" was sold for $10,000. Six months afterwards, "Casa Sevilla" sold for $20,000. There seems to be a pattern in a Frederico Domondon original, that is, the value keeps appreciating. Currently, at 38 years of age, Frederico has accomplished something that a lot of artists have not: he has sold over 1,000 of his own paintings, whether originals or giclees, from $250 to $20,000. Being a prolific artist has helped: Frederico painted over 500 originals in the last 8 years. These are phenomenal records for a self-taught artist of his generation or of any generations. Domondons paintings have an undefinable quality of speaking emotionally to people, whether in terms of color or their unique Monet-meets-Matisse-meets-Van Gogh style. Frederico's work is strongly influenced by the Master Impressionists and has often been compared to them. Some art critics have suggested that "some of Domondon's works belong to museums". Take a close look at his paintings and ask yourself, "How come I dont have a Domondon original on my wall? I wonder what the value of his original paintings will be in the next five years?". In fact, most Domondon collectors have bought his work for purely personal reasons, not as an investment. However, wouldn't it be nice to own something beautiful and very valuable at the same time? "Special Gifts for Special People"
Available at www.domondon.com and at the next Open Studio is Frederico's gift collection of ceramic trivets and coasters, mousepads, notecards, clocks and gift baskets, which are perfect as unique gifts for your special friends or clients. With the fall season coming up, now is the time to plan ahead for the holidays. The Domondon holiday cards will also be available for the upcoming holiday season. Frederico can be contacted for home or office presentations or with other inquiries at 415-640-1657 or by email at frederico@domondon.com. Frederico's latest masterpiece and his current favorite is the "Villa in Gubbio". This Tuscany inspired work is very special - it is the first painting Frederico ever painted on TV during his appearance on "Latin Eyes" on Bay Area KRON TV's Channel 4 last June. He was in the early stage of the painting when the TV crew filmed him working in his studio. Since Frederico started exhibiting the finished painting, he has received some of the most powerful reactions from his patrons. One of them described the painting as Frederico's "best work ever"! "Villa in Gubbio" is destined to become one of Frederico's most valuable art pieces. Currently valued at $35,000, this 2002, 48" x 36" timeless piece is growing rapidly in popularity and value. Limited edition giclees on canvas are now available in 48" x 36" (new size), 40" x 30", 28" x 22", and 20" x 16" sizes. If interested in the original or giclees, please phone Frederico at 415-640-1657.